Top, sides and back (except on pass-through models) are insulated with 1" of high quality insulation. When the master switch is "on," the unit stays "on' at 25% of heating capacity. Four shelf height "micro switch". 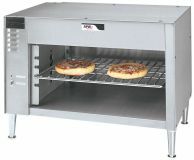 Food placed on rack activates heat to 100% heat "on". The 24" and 36" models have one unit "on-off" switch and one red unit "on" light. The 48" model has one unit on-off switch and one red unit "on" light. There are also right-half heater "on" switches and right and left "on" lights. Use half, or the entire unit as needed.